Although extensions can last a long time, they can't stay in forever and it's always a sad day when they must come out. Minimize the frustration by making sure they're removed with the right products. 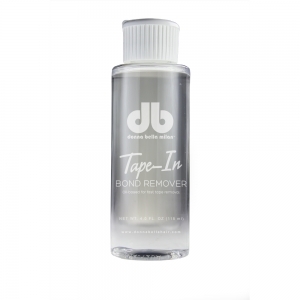 Tape-In Extensions need Donna Bella's Bond Remover to break down the bond quickly and gently without damaging hair. Because the bond remover is oil-based, it helps the extension tape strips slide off smoothly, without damaging hair. Only a small amount is needed for each extension weft, so a bottle lasts a long time. Apply it to the tape strip and make sure the entire bond has been covered with the Bond Remover. Let it sit for a few seconds, then pull the tape strip downward. The tape strip, and the hair weft, should slip right out of the hair. After the extensions are removed, we recommend clarifying the hair. Order replacement tape strips to reuse hair wefts after removal. Using Donna Bella hair extension accessories guarantees that both original hair and the hair extensions are treated properly and last a long time. Our formula is designed specifically to work with Donna Bella hair and tape; we recommend only using our products for the best results. Do not use Tape-In Bond Remover to remove Kera-Link extensions.